November 7th was National Learn How To Homebrew Day and the GOBS (Goshen Oak Brewing Society) decided to plan a Big Brew Day. 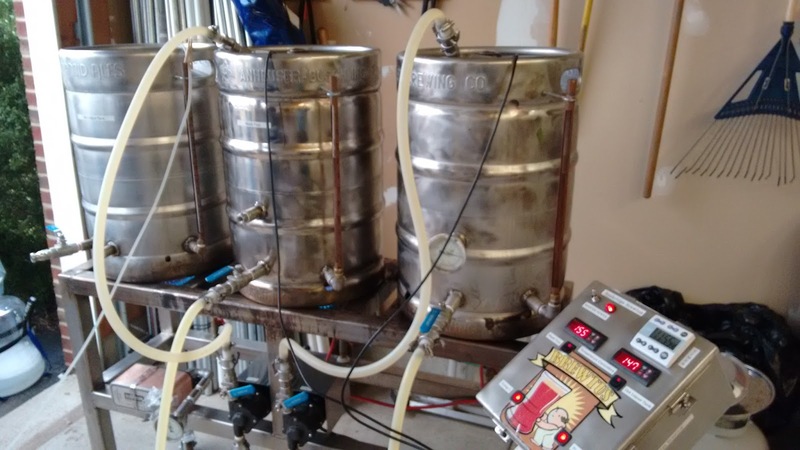 There were 11 brewers who combined their systems to make 55 gallons of beer! Five 10-gallon batches of Russian Imperial Stout were brewed, and split into individual 5-gallon vessels to be fermented separately. 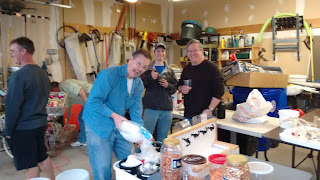 There was one individual marching to the tune of their own drum making their own 5 gallon batch. 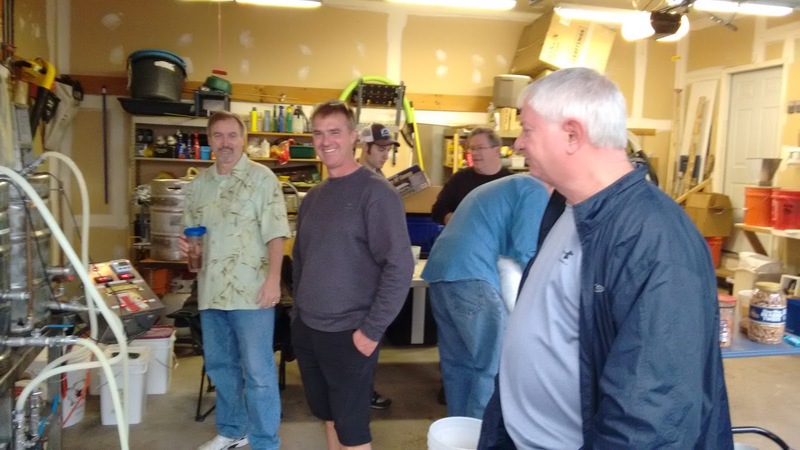 The group organized the event through a lengthy back-and-forth email chain. After a little deliberation a version of the winning RIS from NHC 2012 (Chernaya Polnoch) was chosen. Everyone was left to their own devises for yeast. I believe there will be versions fermented with American Ale yeast, Nottingham, London ale (Wyeast 1968*), Ringwood (Wyeast 1187*), Irish Ale (Wyeast 1084*). 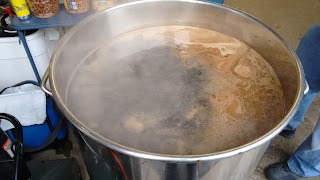 Despite having the ability to brew 10-gallon batches since the inception of my all grain brewing equipment (circa 2010), this was actually the first time I have ever done so! 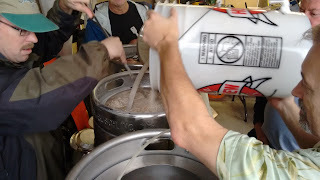 An RIS was definitely pushing the capacity limit on my mash tun - a 52 qt coleman xtreme was filled with 32 lbs of grain and 9 gallons of water. We could barely close the top on the mash tun and had to top off the boil with 3lbs of DME. The batch using my equipment finished at 1.088 FG which should result in an 8.5%-9% ABV Russian Imperial Stout after fermentation is all said and done. The brew day went-off with only one real hitch - we all finished roughly around the same time and only had one water source to chill our batches. This left many of us impatiently waiting. 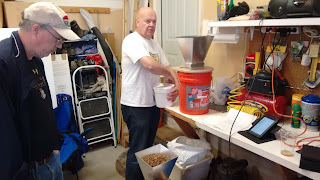 During the day we were able to utilize a newly motorized grain mill. A Brutus system was used to perform two separate mashes. 10 gallons was transferred to another boil pot and burner, and 10 gallons remained on the brutus system to boil as normal. 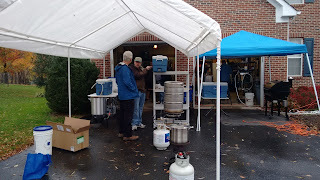 A few of the attendees were extract brewers who were able to fulfill the "Learn" portion of the event. I think we may have a few converts now that they have seen how easy it is to make an all grain wort. 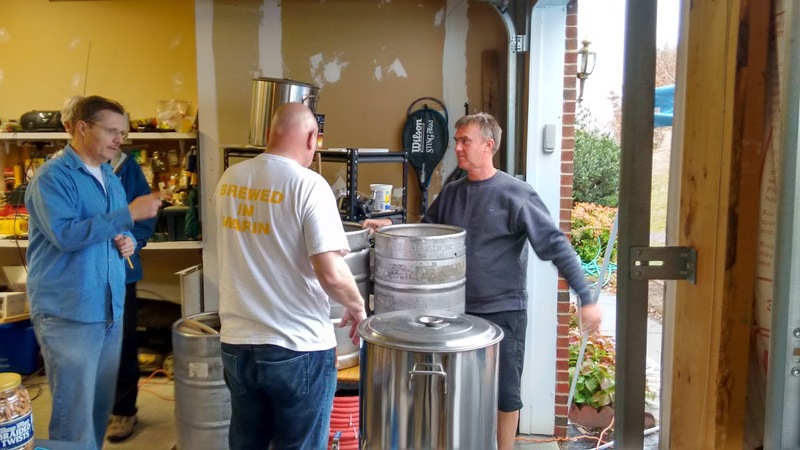 * - Does your local homebrew store not stock Wyeast? Check my yeast strain chart for comparable alternatives! Oh I love it!! I also want to learn how to homebrew!